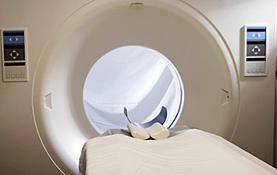 Will your RFID implant explode during an MRI? As seen in "MythBusters: Viewer Special II." Explanation: If you love traveling with your pooch, it may be a good idea to outfit him with an RFID chip. Pet Radio Frequency Identification Devices, aka RFIDs, are tiny metallic microchips encoded with the owner's contact information and possibly the pet's medical history. Say Fido gets lost during a journey. If he's rescued, a veterinarian can wave a radio wave scanner across the implantation site and access the microchip's information. Presto, the vet can get in touch with you. Humans can also get RFID implants, which would typically contain personal medical information, such as blood type, allergies and disease history. The tech could be a handy tool for doctors, but MythBusters fans have worried that if someone undergoes a magnetic resonance imaging — or MRI — scan, the machine's powerful magnetic waves might rip the metallic chip out of the skin or cause it to explode. MythBuster Kari Byron agreed to take one for the team by getting an FDA-approved RFID tag implanted in her arm and sliding into an MRI machine. Thankfully for Kari (and her arm), the rice-sized piece of metal, which is also encased in a glass capsule, was too minute to catch the magnet's attention. Without any metal-magnet interaction, the RFID tag passed the MRI test, and proved this explosive myth busted.